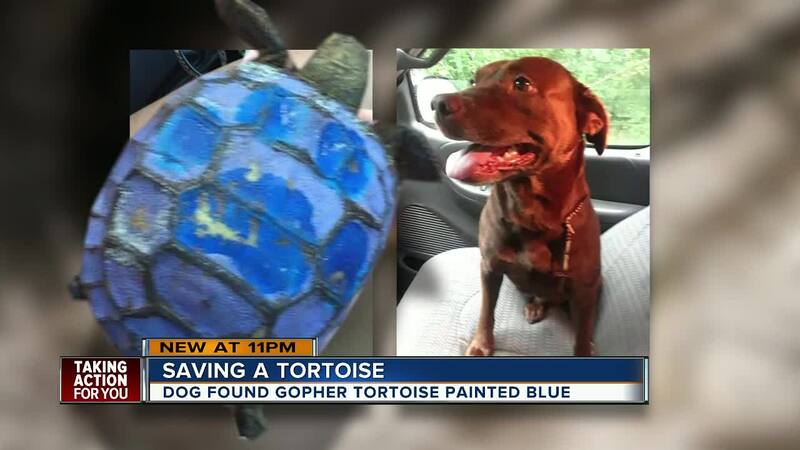 ODESSA, Fla. — A Pasco County woman said her dog found a gopher tortoise painted blue while it was playing outside. "We thought it was a rock because it was painted until it started moving on the floor. It was a little baby turtle. We picked it up instantly and told the dog, no. She didn't know any better," said Daylynn Hughes. Owl's Nest Sanctuary for Wildlife in Odessa rescued the 2-year-old gopher tortoise. Kris Porter said she spent about nine days scrubbing the paint off of its shell. She reported the incident to state wildlife officials. It is illegal to mess with a gopher tortoise and its burrow. "Sometimes we get lucky. We've had some others in the past, older ones that had been painted and people see things, but not this time," said Kris Porter, Director of Owl's Nest Sanctuary for Wildlife. Porter doesn't know who vandalized the reptile but says it's harmful. "It gets into their system. You're dealing with a paint product that's going into their shell and their lungs are actually right at the top on a tortoise," said Porter. FWC says it is both illegal and very harmful to the health of a gopher tortoise to apply man-made substances, such as paint, to any part of their body or shell. Porter released the gopher tortoise this weekend. She hopes whoever harmed the gopher tortoise realizes there are consequences to their actions. "It's more than disturbing. It gets depressing where people want to take their fun out on animals," said Porter. "That's animal abuse. That's cruelty to an animal. My first thought was I'm not going to let this turtle go if it is painted," added Hughes. Any information on this incident or other Florida Fish and Wildlife violations can be reported to the Wildlife Alert Hotline at 888-404-FWCC (3922).